Plagiarism Checker X is a software tool which can identify identical content on web pages and in document files. All types of people will find this software useful such as webmasters, bloggers, educators, and scholars. It only takes seconds for the software to scan these web pages and when it is done, you will receive a fully detailed report on the results in HTML format. This report will give you a percentage of how similar the content is to other content already published on the internet within seconds.. These different levels of similarity will be represented by various colors. There are plenty of plagiarism checkers online, like Copyscape or Turnitin, but the problem with them is they require you to upload your content directly to their website. Since a lot of people are concerned about their privacy and feel nervous about uploading sensitive documents to a third-party website, they often don't want to use plagiarism checkers for this reason. However, Plagiarism Checker X solves this problem by allowing users to download the software right to their desktop and then run it on their own computer. That way, their private content does not get stored on any internet server for others to possibly look at. The desktop software searches the internet and does a cross comparison between the content in your computer's documents and the content on those 16 billion web pages which have been indexed by the two major search engines; Bing and Google. You can start using the software for free so you can detect any possible plagiarism in your content immediately. Usually, the writers, bloggers, editors, educators and those who you're performing SEO on websites will find this application highly useful. Fortunately, Plagiarism Checker X software has an option to perform a bulk search on groups of documents with just the click of the mouse. 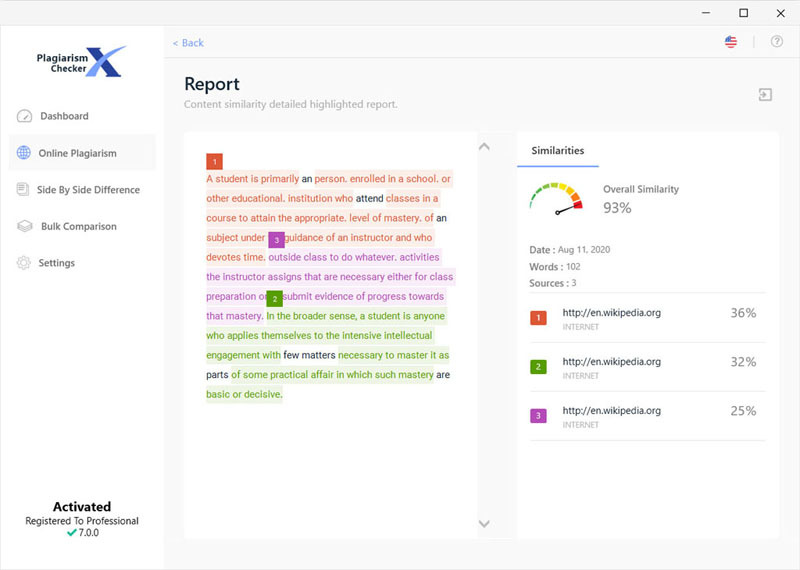 If you're looking for a free and better substitute to Copyscape, then Plagiarism Checker X is definitely worth trying out.